the cave clan started in the 80’s when 3 guys went down a drain. nothing exciting about it really. Over the last couple of decades the cave clan have gathered in members and have ventured into exploring abandoned buildings rather than just drains. I have never been a member of the cave clan and nor will I be after the events of the past year or so. It all started off for me when I began to use my camera and take photos after not using it for a while. My interest was abandoned buildings and then onto drains. I have never been one for joining a group or one for rules. That meant the cave clan wasn’t for me, as they have rules about what photos you can post and what information you can share with your friends about new abandoned buildings. If I have information about an abandoned building that I know a friend doesn’t know about I’d share it. If I were in the cave clan I wouldn’t be allowed to share said information with them. that to me is just wrong and reminds me of a cult that tries to split the ‘URBEX’ community apart for their own ego. 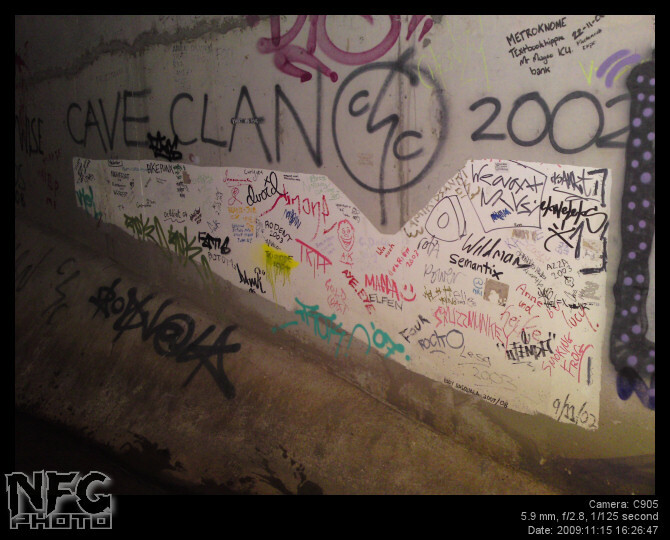 Having said that, I do appreciate the Cave clans dedication to preserving abandoned buildings from tagging and graff. That alone should not be a reason to withhold information from other non CC explorers who you trust who also would like to goto these places and photograph them. I don’t understand that rule, But I am not one for rules. For me it just seems a little bit elitist and egotistical. The hypocrisy that I am talking about is their stance with graffiti in drains. This is a quote from the CC Wikipedia page. Graffiti is graffiti. it doesn’t matter how big the tag is or where it’s done. it’s still graffiti. Is tagging an entire wall of a drain in big letters considered discrete? In my opinion I am not convinced that it’s discrete and a blatant message telling others that venture down the drains that they rule the drain. But that’s just my opinion. No one has claim to the drain and should tell others what to do down there. Only the government has that power and the water authorities. The drains that I have explored in Melbourne (where the cave clan started) are littered with tags and graffiti from CC members. how can one group be so opposed to graffiti and then tag and graff the drains they are protecting against graffiti artists?